My friend Joe, who has a particularly intense job, often comes over and helps me prep and cook; the rhythm of the kitchen, with its chopping and sauteeing, mixing and mashing, is a well-known remedy for many of us. And summer grilling, the fragrant smoke and the promise of charred goodness, is especially heady and therapeutic. One of Joe's go-to dishes is bacon-wrapped prawns; admittedly, it's hard to resist salty, crisp pork wrapped around plump, local shrimp. Joe makes a quick stock with the shells before reducing it down to make a basting liquid, which adds moisture and depth of flavor. I sometimes substitute thin slices of prosciutto for a quicker, easier version (no need to "precook" the cured slices of prosciutto), which is what I've included in this recipe. 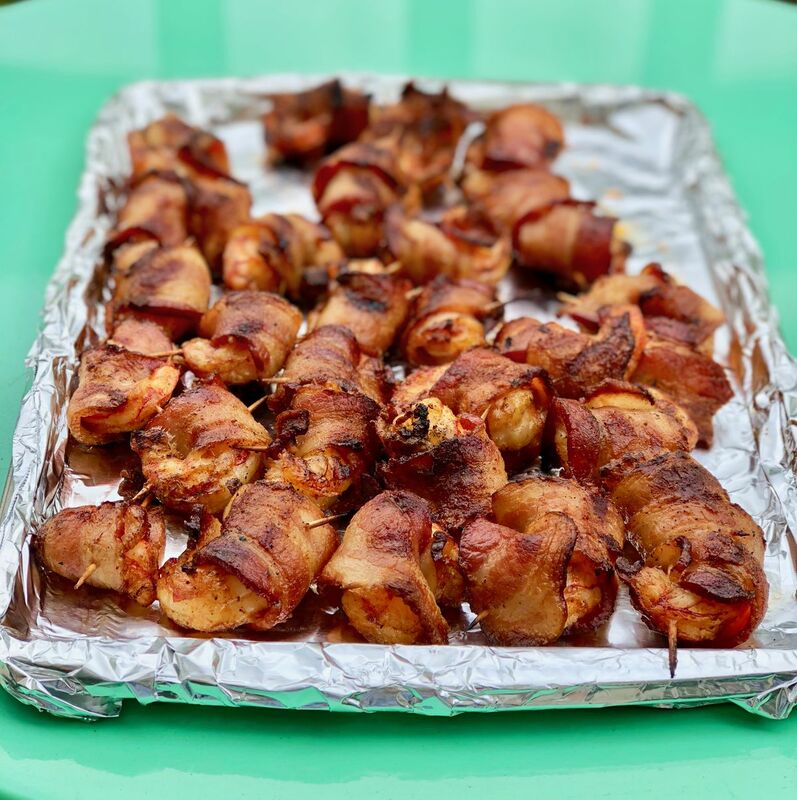 Note, if using bacon, cook it first for a few minutes (you want it to be limber enough to be able to wrap around the shrimp) so it will crisp up on the grill without overcooking the shrimp. As an East Coaster, Joe favors Old Bay seasoning. I reach for a Creole spice blend, but both work well here, so choose your favorite. Serve as an appetizer with cocktail sauce or other dipping sauce such as aioli, chimichurri or harissa. These are also delicious on a salad or piled onto warm French bread with mayo, lettuce and tomato for an impromptu po-boy sandwich. 1. Peel shrimp; place shrimp in a bowl and place the shells (and heads, if any) in a small saucepan. Remove any veins and rinse shrimp, if needed, and pat dry thoroughly. Place shrimp back in bowl and toss gently with two teaspoons Old Bay or Creole seasoning and 1 teaspoon garlic; place bowl in refrigerator until ready to use. 2. Add two cups water to saucepan with shrimp shells and remaining teaspoon seasoning and remaining teaspoon garlic, and the butter. Bring to a boil, reduce heat to medium-low and let simmer about 15 minutes; remove shells from pan and increase heat; let liquid cook down another 10 minutes or so; add a dash of Worcestershire or hot sauce; set aside. 3. While stock is cooking, wrap shrimp with slices of prosciutto and thread onto toothpicks (see note above) or metal skewers. When ready to cook the shrimp, start a charcoal or gas grill (about 400 degrees) or preheat the broiler to high. Note: If using bacon, cook bacon until cooked about halfway through; let cool slightly. Wrap bacon around shrimp, cutting bacon slices as needed to wrap around the shrimp in a single layer. Thread prosciutto-wrapped shrimp onto toothpicks (see note above) or metal skewers. 4. Place shrimp on grill and cook, turning once and basting every so often with reduced stock, until prosciutto is crisp and shrimp just cooked through. Serve warm with lemon wedges and/or your favorite dipping sauce.